The #ExxonKnew campaign launched in 2015 after a series of articles were published accusing ExxonMobil of secretly studying climate change while outwardly denying climate science. Those articles kicked off an aggressive activist campaign, including a complex social and traditional media operation, and an aggressive legal strategy, all geared towards convincing public officials to investigate and prosecute the company. What do all of these components, from the original articles to the academic research and activist groups, have in common? They have all been bankrolled by the Rockefellers, a wealthy family that owes its riches to the very company it is now seeking to destroy. But the money did not come from the Rockefellers’ personal bank accounts. Instead, they used various entities including the Rockefeller Family Fund, Rockefeller Brothers Fund, and Rockefeller Philanthropy Advisors to fund activists, media organizations, legal entities, public relations firms, and even the academic studies used to bolster the campaign and legal action. What follows is the story of how this climate campaign came into existence, the key organizations involved, and how Rockefeller money has made each step possible. The coordinated #ExxonKnew campaign dates back to a 2012 conference held in La Jolla, California. The event was hosted by the Union of Concerned Scientists and Climate Accountability Institute, two groups who receive funding by the Rockefeller Brothers Fund. The purpose of this meeting was to discuss ways to compare energy companies with “Big Tobacco” and analyze the successful legal and public relations strategies used against tobacco companies in the 1990s. The end goal was to use the same playbook against energy companies to remove these companies’ social license to operate and secure large financial settlements through litigation. During the La Jolla workshop, the attendees discussed opportunities to engage Congress and state attorneys general to investigate energy companies and subpoena their internal documents, as well as finding plaintiffs to sue based on climate impacts. Notably, the same lawyers who secured the $200 billion settlement with the tobacco industry are now pursuing litigation against energy companies – namely Steve Berman, whose firm has represented various municipalities including King County, San Francisco and Oakland, and Sharon Eubanks, who has presented about litigation to various attorneys general offices. Many of the La Jolla workshop’s attendees have become central figures in #ExxonKnew: Matt Pawa, the lead attorney in many of the dismissed climate cases and then head of the Rockefeller-funded Global Warming Legal Action Project; Climate Accountability Institute’s Rick Heede; Harvard researcher Naomi Oreskes; Union of Concerned Scientists’ Peter Frumhoff; and others who would continue to play leading roles in the campaign in the coming years. In 2013, Rick Heede, the head of the Rockefeller-funded Climate Accountability Institute (CAI), took the lead in writing academic journal articles to bolster the campaign. He partnered with fellow CAI board member and Harvard professor Naomi Oreskes to write a series of academic papers attributing greenhouse gas emissions to specific companies, in a manner that vastly distorts the companies’ contributions: the research essentially blames consumers’ emissions on the companies that produced the raw materials for those fuels. Oreskes is credited with conceiving the La Jolla conference and has admitted to presenting her work to staff from a number of Attorneys General offices alongside Sharon Eubanks, who spearheaded the prosecution of the tobacco industry. Taking Heede’s efforts a step further, Oreskes and her Harvard colleague Geoffrey Supran later published a study accusing ExxonMobil of misleading the public on climate change. The broadly criticized study was bankrolled by the Rockefeller Family Fund. In September 2015, InsideClimate News (ICN) published the first article in its #ExxonKnew series, accusing the company of internally conducting research on climate change, while externally promoting a campaign denying its existence. A few weeks later, the Los Angeles Times published a nearly identical investigation by students of Columbia University’s Graduate School of Journalism. David Kaiser of the Rockefeller Family Fund and Valerie Rockefeller Wayne of the Rockefeller Brothers Fund later admitted that they funded the Columbia program with the explicit purpose of writing the original #ExxonKnew pieces. ICN alone received over $1.2 million since 2014 from the Rockefeller Brothers Fund and Rockefeller Family Fund. In fact, Michael Northrup, director of the Sustainable Development grantmaking program at RBF, “provided the seed grant that got InsideClimate News started in 2007,” and RBF remains a “core funder” to this day. Within weeks of the ICN and Los Angeles Times reports’ publication, the most “sympathetic” state attorney general – Eric Schneiderman – announced he had opened an investigation into ExxonMobil’s statements on climate change. A source later admitted that the Rockefeller-funded reports made the issue “more ripe” for an investigation of ExxonMobil. In January 2016, the Rockefellers re-convened their activist network – this time at a strategy session hosted at the shared offices of the Rockefeller Family Fund (RFF) and Rockefeller Brothers Fund, under the leadership of RFF Director Lee Wasserman. Coming on the heels of Schneiderman’s announcement, this follow-up strategy session aimed to “delegitimize” ExxonMobil and develop a coordinated social media and messaging campaign, according to a memo obtained by the Washington Free Beacon. Meeting attendees included representatives from 350.org, Conservation Law Foundation, Greenpeace, Oil Change International, the Center for International Environmental Law (CIEL) and Matt Pawa. Unsurprisingly, the Rockefellers funnel millions of dollars into each of these groups. 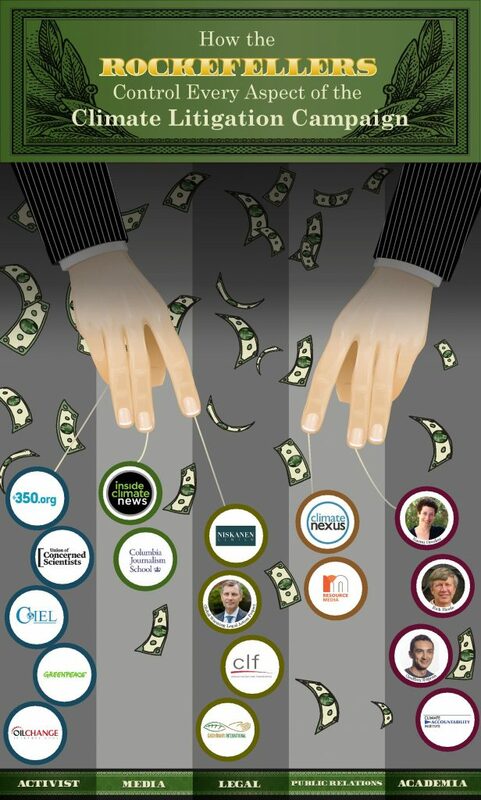 The Rockefeller Brothers Fund, Family Fund, and Philanthropy Advisors have given nearly $5.7 million in grants to 350.org, the Union of Concerned Scientists, CIEL, Oil Change International, and Greenpeace in the past 10 years alone. These Rockefeller-funded and coordinated meetings had a direct impact on action taken by public officials. Just two months after the RFF meeting, State Attorneys General from Massachusetts and the Virgin Islands announced they would be joining Schneiderman in opening their own investigations against ExxonMobil. Reuters confirmed that Peter Frumhoff of the Union of Concerned Scientists and Matt Pawa helped advise the attorneys general to take this action. The Rockefeller Brothers Fund gave Matt Pawa’s Global Warming Legal Action Project at least $200,000 to “develop and apply a tort law approach to global warming that will require major greenhouse gas emitters and fossil fuel companies to internalize the costs of their contributions to global warming.” The Conservation Law Foundation, which sued ExxonMobil for “decades long climate deceit” and has at least three former employees in Massachusetts Attorney General Healey’s office, received similar support. In addition, the Rockefellers have direct ties to several of the climate lawsuits being brought forward by local and state governments, claiming companies are liable for climate change impacts. In Colorado, two non-profits, EarthRights International (ERI) and the Niskanen Center, are serving as co-counsel in the lawsuit filed by the City of Boulder, Boulder County and San Mateo County. The Rockefeller Brothers Fund awarded $200,000 to the Niskanen Center less than two months before the lawsuit was filed. ERI, who is also actively pitching cities in South Florida, lists the Rockefeller Family Fund as an institutional donor and appointed Kavita Ramdas, a trustee for the Rockefeller Brothers Fund, as a board member. From the very beginning, the #ExxonKnew campaign has been organized and funded by the Rockefellers, whose resources have also supported anti-fossil fuel activists who want oil and natural gas companies to “pay” for climate change. Although the campaign has largely stalled, it hasn’t been from a lack of varying approaches by the Rockefellers – from paid-for “journalism” to state investigations and now municipal lawsuits. It’s unclear what the next phase of this campaign may look like, but whatever it is, it will likely be made possible by Rockefeller wealth.